For the price this cannot be beat. Thick, well made, great colors. I have had mine for years and it has held up extremely well. Despite a dog and two kids, still looks new! 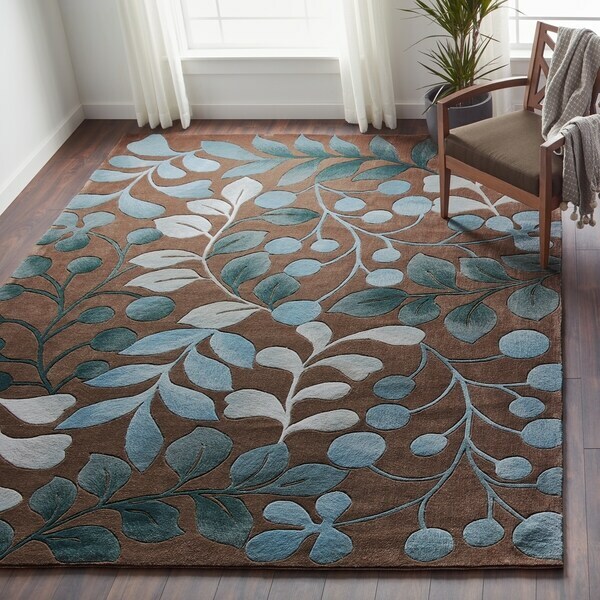 Soften your sitting area with this calming botanical area rug by Nourison. Hand-tufted from polyester, the warm brown background is paired with blue and beige leaves for a natural look. Dress up the plush pile with metallic accents and your favorite potted plant. A wonderful milk chocolate and various shades of blue rug that looks great with my new couch and loveseat! The blues contrast nicely with the milk chocolate brown. 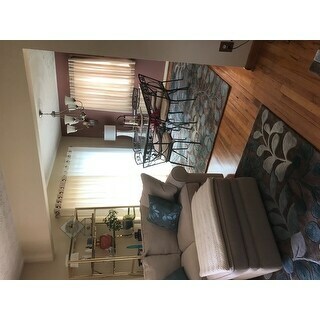 The leaves and berries are larger than I initially thought, looking at other pictures on this site showed me what I would get before I ordered it (the 10x8 or 9x7 rug in front of the white couch picture showed the proper scale of the leaves and berries). Awesome rug for which I am getting wonderful compliments. Thank you! The Nourison Hand-tufted Contours Botanical Mocha Rug was recently delivered to my doorstep and arrived just a few days upon placing the order. The product description was right on target and it definitely far exceeded my expectations. Upon unrolling the rug, I was more than pleased with the quality of the product. The plush feel to the carpet is especially pleasing and rich in color. The various colors within the pattern enabled me to accessorize the room with a variety of blue and neutral tones. I love everything about this rug, and the thickness is perfect to give it a high quality look. It is not only decorative, but brings life to the room. I was looking for a rug that could be used during various seasons. This is one that I can definitely use during the Spring, Summer and even Fall. I bought throw pillows for the sofa and loveseat to bring out two of the colors within the carpet. Looks absolutely beautiful! I would definitely recommend this product to a friend or relative. Thank you! I chose the Nourison Hand-tufted Contours Botanical Mocha Rug in the 5'x7'6" because it had all the colors I needed for my bedroom. The colors are beautiful and because of the quality, this rug will last many years. There is nothing I don't like about it. I am both happy and disappointed at the same time. lol Happy because the rug is pretty and nice but disappointed because I was hoping for a bright rug and this is not, the blues are dark and muted. I still like though so don't get me wrong. In the online picture sometimes the background looked grey to me and sometimes brown. Looking at it in real life it is a chocolate brown. I am also disappointed because coming back here to leave the review I see the rug is 20 bucks cheaper than it was a week ago when I ordered it. lol I the end i gave it a 5 stars its a nice rug. This rug is gorgeous. Colors are true to the photo on line. I love the "mocha" background, it is a medium tone yet very rich in color. If you are looking for a 'dark brown' background this may not be dark enough for you. Blues range from silvery to deep mediterranean. The lightest color is more on the grey side, not off white (or beige). Overall the rug has a sheen to it that adds to its richness. The color scheme works very well together. This rug is versatile & could be used in various settings - from formal to contemporary. 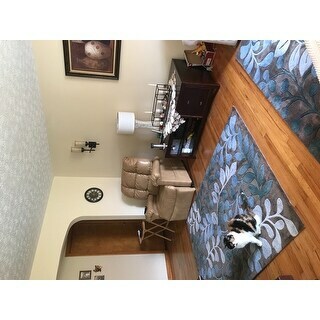 I previously purchased a Nourison rug and have been very satisfied with the quality. The package arrived undamaged and within the specified time. The corners and edges lay flat & do not curl up (very important). I would absolutely buy this rug again. I was skeptical when ordering as I was unsure how deep the browns would be. This is an extremely high quality rug and the colors are accurate. It will look great in the area I plan on using it in. This rug is well made and densely tufted. The face of the rug is soft and smooth, and the colors are very true to the photo here -- taupe to brown on the background, shades of blue ( true blue to teal and turquoise) in the design. I have received many compliments because this rug is truly striking. That said, I need to say that my furniture is a solid color. The design on the rug is so vibrant that I'm not sure it would blend well with patterned furniture. I was impressed with the reviews of this rug, and it did not disappoint! The pile is appropriately thick and the design is crisp as outlined in the pictures. The color is slightly darker than would appear on the computer screen, but I had anticipated this from the reviews and am pleased with the deeper brown tones that appear in parts of the rug. Shipping was prompt and the rug was appropriately packed. There was minimal "new rug" smell on arrival, which dissipated mostly within 24 hours. Given the price of comparable rugs I had seen in numerous stores in Manhattan, and given my disappointment with other rugs I had purchased on the internet, it was great to find a rug online whose quality and style stood up to description. I got this rug as an area rug for our living room. That room is carpeted, but I ordered this rug for an added accent in there. The rug is very plush and of excellent quality with a great pile. I love the colors as it goes with so many other complimentary colors together. It’s a beautiful rug and great addition to spice up our living room with some added color. It does she’s a little with being new, but vacuums beautifully with normal wear. Well worth the money as it’s extremely well made and a gorgeous rug. It definitely has earned 5 STARS just for its quality alone. This rug is GORGEOUS! I have a brown couch and wanted a brown rug, but wanted color accents and this rug fits the bill. I love the teal and blue colors int he leaves. I'm thinking I might replace my brown recliner with a light blue recliner to bring out the colors in this rug. 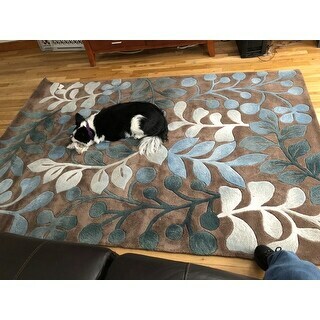 This rug is just like the other two I've received, such great quality for the price. This rug will be enjoyed for many years to come. Thanks, Overstock! Love the rug. Had to air it outside for about a week. The new rug smell from the dyes or whatever were very strong, but now it's fine. beautiful rug . thick and plush .nice colors. 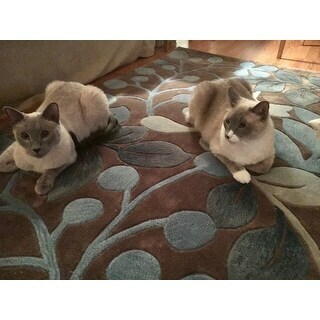 my cats like it too. Even the mother-in-law loves it! I got this rug for my bedroom to add a plush, luxurious feeling to the room. It certainly does that! It's exactly the color I was looking for and it feels fantastic! I bought 5 rugs from Overstock and this one was the most expensive, but I just couldn't resist. I crossed my fingers the whole time I waited for it to arrive, just hoping that it would be everything I wanted. It was! I was so pleased. The colors are gorgeous. My husband is thrilled with it. My mother in law loves it. Everyone who sees it ooohs and ahhs. Nice quality rug! Love the colors! Fast delivery! Very happy with my purchase. EXCELLENT ,VERY GOOD COLOR,SIZE AND QUALITY. I am loving this rug! I bought it for my dining room and it fits perfectly! I have a small dining room though, so be sure to check the dimensions before you purchase. But I'm amazed by the quality for the price I paid! This rug is thick and durable - it seems very well made. And it's very plush and soft. I'm very happy with this purchase and would recommend to anyone. I loved this rug, high quality and I would recommend this rug to all. Beautiful rugs I am very satisfied with the change for a new look!! Striking beautiful. Great quality. Well made. These rugs are very durable. We had two dogs an five extra people in our home for about a year and I must say it has held up very well. The rug was pretty true to description. Nice pile, loved the pop of teal! Beautiful rig. Thick and so very durable..Great price also well worth the money. I would highly recommend this rug. Amazing value, colors as shown and quality was above expectation! Compliments received and I recommended Overstock to friends. "Seems that several people said this is pilling. Did this get better after the initial “breaking in” time?" Yes this is a low shedding rug. There shouldn’t be any issues once rolled out and vacuumed. I have had it for several months with average traffic and no shedding. "Is this an outdoor rug, as well?" No, this is not an outdoor rug. Dimensions are: 5 feet x 7 feet 6 inches. "Does this rug come in any different colors? If not, do you have anything with leaves of green?" We have another color option under ITEM# 13408948 that may work for you. There is definitely green in this rug. I was thinking it would be more blue and silver. The vines graduate from blue-green to green. The brown wasn't as dark either. "do you have a matching runner to this item"
"one of the review photos looks like the end is curled up. Does this rug have weight to it? will it lay flat?I have an expensive rug that lays flat, it is plush and heavy. It is the price of what this rug suggested retail price is. The last time I bought a rug this size for roughly the same price it was thin, cheap and corners did not stay down -even aftler putting weights/books and keeping it unrolled for weeks." It does come rolled up, however, it does lay flat pretty quickly. I did have a curled up corner for a few days but it quickly laid down. The rug is very well made and is beautiful. Well worth the price I paid. "Is the blue turquoise or real or just ref blue"
It is a beautiful soft turquoise. I found the colors of my carpets, that I absolutely love, to be as exactly as shown in the photos. The colors in the rug are true to the picture. Beautiful and dense rug. Perfect!